Well, you can have a good jump start at a new you by going by a healthy diet and having a good workout routine. 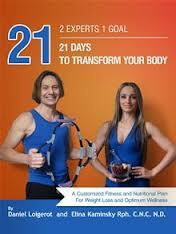 The authors do recommend a strict diet during the 21 days! That means no ice cream, soda, candy, or anything fattening. There are a few items you'll need to have to do the workouts: a DL FIT ball (a fitness ball will do just fine), resistance cables (AKA - bands); a stationary bike (Don't worry if you don't have one. You can use a treadmill or go for a jog. ); a yoga mat, a spacious room, dumbbells (for a few routines), and a multitoner (MT) (I've never heard of this before.). The workouts include a mix of core moves, stretching and a bit of Yoga style moves. You can increase the intensity by adding the bands, dumbbells and MT, therefore increasing your strength over time. Yes, there is quite a bit of floor work, but everything is basically simple and can be done by anyone. If you can't afford a gym membership, then 21 Days to Transform Your Body may be the next best thing to get you started into a healthy lifestyle. I believe that having a strong core will help improve your health and help you to become more active. With the proper diet and regular workout routines, you can improve your mind and body throughout this 21 day plan.